2014 will see the 9th year of returning to Europe for the summer. 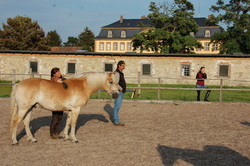 We get busier every year running workshops and individual session as the word about Humanship Horsemanship spreads to an ever growing number of people looking for another way with their horses. This year we are in Germany, Switzerland and Austria from end of May until the begining of October. To keep track of us by looking up our calendar here. About half our workshops were booked last year, so if you want to organise a workshop in your area please contact us. There is still plenty of space (mainly weekdays) for individual sessions or problem specific help. This year we are also running a workshop in Capadocia, Turkey in September. If you are looking to have a holiday in September, join us for a 4 day workshop and then relax on a 3 or 6 day trail ride around this amazing area. More details coming soon. Contact us and we will help you organise something.